When Huldremose Woman died in Denmark around 160 BC, she had just eaten her final meal — coarsely ground rye. More likely than not, that Iron Age woman, whose remains were found preserved in a peat bog, had enjoyed a piece of bread not unlike the ones John Mellquist prepares in East Thetford each Monday. Take his kokojyväruisleipä, a Finnish whole-grain rye sourdough loaf. The dense, acidic slices are dotted with pieces of rye meal that give it a texture more like porridge or oatmeal than smooth, modern white bread. It feels like a meal: A few hearty slices could be enough to get a worker through a long day in lean times. A grassy, slightly gamy flavor imbues the loaf with the suggestion not only of a place but of a long-past time. At Trukenbrod Mill & Bakery, Mellquist is all about doing things the old-fashioned way. Since moving his business from his own farm in Vershire to Cedar Circle Farm & Education Center in the spring of 2009, he has achieved his goal of performing every step from scratch. Mellquist grows his own rye, wheat and spelt on several acres spread across three properties belonging to the organic farm. He harvests it himself with the help of a team of horses, then cleans the grain in a rickety wooden thresher that has been running for more than 150 years. After milling the flour himself, he bakes breads that can’t be found anywhere else in Vermont. This summer was a good one for Mellquist: It was the first that he was able to harvest his own spelt. Because of its difficult-to-remove, rice-like husk, he’ll have to bring the ancient grain to local flour giant Butterworks Farm in Westfield to be properly cleaned before use. Mellquist says that, unlike wheat, spelt “hasn’t been tampered with much” since it was first documented in Iran 8000 years ago. It’s also been a good year for rye, nearly an acre of it. 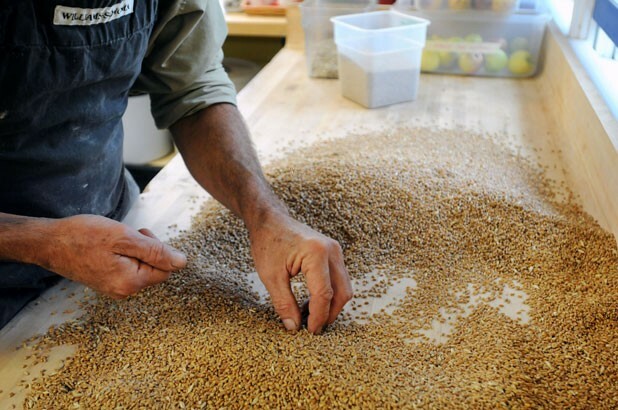 This season, for the first time, Mellquist can bake with his own grains rather than purchasing them from other Vermont or Québec farms, as he has been doing since he started Trukenbrod a decade ago. The labels on his bread proudly trumpet that the raisin pumpernickel is made with 100 percent whole-grain 2012 rye grown at Cedar Circle Farm. The sun flax is composed of 2012 hard red spring wheat and dotted with roasted flax and sunflower seeds, also grown on site. The bread’s dense texture is due partly to the whole grains; sharp shards of rye pop the bubbles that would fluff white bread. Over a cup of coffee at the farm’s quiet Hello Café, Mellquist speaks with intensity about the chemical advantages of his sourdough breads. People with wheat allergies usually have no problem digesting rye or spelt, though celiac sufferers should stay away. In general, the fermenting process that Trukenbrod’s starter undergoes makes the breads easier for everyone to digest. Mellquist references Sally Fallon’s book Nourishing Traditions as inspiration for his Weston A. Price-inspired food philosophy. “From Scotland to Switzerland to Native American fermented forms of corn or maize, if they [grains] are not fermented, they are very difficult to digest. If you ferment it, it completely transforms,” he says. Now 64, the baker came to the East Coast from California to attend Dartmouth College as a music major, but Mellquist says he’s had a passion for baking bread since childhood. He got the sourdough culture he still uses 20 years ago from an Idaho microbiologist. The seller was able to trace the starter to a French bakery that began using it in the late 18th century. Though the amateur food anthropologist and historian in him is excited by the culture’s backstory, Mellquist is most interested in its nutritional role. “It was discovered long ago that [fermenting food] releases minerals,” he says, his blue eyes glinting with passion beneath his tweed flat cap. “In relative terms, it has to do with the relative acidity — a proper sourdough is 100 times more acidic than a yeasted dough. That makes all the difference in terms of breaking down the chemical bonds of the nutrients.” The bacteria digest some of the grains’ sugars and starches as well as releasing good guys such as vitamin B.
Incidentally, Mellquist passed his passion for healthy, local food to his son, chef Seamus Mullen. The owner of New York’s Tertulia and third-place finisher on “The Next Iron Chef” recently published Hero Food, a cookbook to help fellow rheumatoid arthritis sufferers eat a delicious and potentially curative diet. Once the grains have dried, they go across the street to a barn filled with both modern and historic farm equipment. Mellquist is in the middle of fixing a “new” thresher that’s nearly a century old. The one he uses now is more than 50 years older, and still works with long-rusted screens that separate wheat from chaff. It’s not perfect, but the occasional hard chunk in the bread makes it feel all the more authentic. It’s hard to believe any chaff makes it through, looking at Mellquist’s flour. He mills the smooth white powder in the kitchen, where the farm’s chef, Alison Baker, also makes jams, jellies and cookies for Cedar Circle’s bustling store. Mellquist sells his loaves and raw flours there through the end of October. Off-season, he continues to produce them for the Upper Valley Food Co-op in White River Junction and South End Market in Bradford. A family that has constructed mills for centuries made the baker’s electric Iseltaler Getreidemühlen just for Mellquist in Austria. His isn’t so different from the originals. Though now coated in the flour it produces, the wooden, Alpine-style contraption looks like it wouldn’t be out of place inside a gingerbread house. The 7-foot-tall machine’s stones are placed horizontally, allowing them to press the grains slowly, which prevents the delicate flour from overheating as it’s ground. Once all that is done, the painstaking process of making the breads begins. It’s no wonder that, even with a farm staff of 30 in the high season, Mellquist bakes just 75 to 100 loaves a week. “It takes several feedings before it’s ready to make into bread,” he says of his starter. “It’s definitely a life cycle.” Once the fermentation porridge is ready to meet the rest of the dough, the mixing process takes about six hours before the bread is ready to hit the oven. That’s why, when Mellquist teaches his first baking class at Cedar Circle later this month, it will require a two-day commitment. Despite the time investment, he says the class is designed for home bakers, who will learn to make breads including German vollkornbrot and leinsamenbrot, Finnish jalikiuunileipa, Portuguese broa de milho, Danish rugbrod, and French pain complet. “People don’t need to have experience,” Mellquist says. “They should just come with any interest they have.” Someday he hopes to share his diverse collection of recipes in a book. And plenty to taste, of both the past and the future. John Mellquist teaches a two-day course in preparing sourdough breads on October 20 and 21, from 8 a.m. to 5 p.m. both days, at Cedar Circle Farm & Education Center, 225 Pavillion Road, Thetford. Info, 785-4737. cedarcirclefarm.org. Combine all ingredients except the salt in a bowl with hands or a spoon. Mix just enough to incorporate the water. The ideal dough temperature is 74 degrees Fahrenheit. Cover the mixture and let it stand for half an hour to an hour. Sprinkle salt over the surface and mix thoroughly. Using wet hands, pull and stretch the dough all around, until it becomes stretchy and somewhat elastic. Rub a little olive oil inside a large bowl, place the dough in the bowl and cover it. At 30-minute intervals, fold the dough over four times, pulling and stretching it each time. Repeat this folding sequence three times. About three and a half hours after initially mixing the dough, divide it into three equal parts. Flatten, roll and shape these pieces and place in well-oiled bread pans. Cover the pans and allow them to proof until the dough has risen by about half of its original volume. Place the loaf pans in a 500-degree oven. After 10 minutes, turn the heat down to 400 degrees. Bake an additional 25 minutes. Then turn the oven down to 325 degrees and bake about five minutes longer. As ovens vary, these temperatures and times are only suggestions. Generally it takes 40 to 45 minutes to bake a loaf of bread. Allow the loaves to cool overnight before slicing.